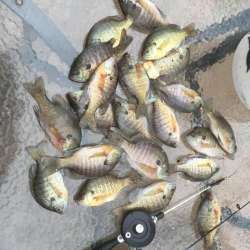 For more Bluegill photos visit Lake-Link's Photo Gallery. 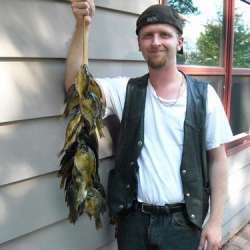 Bluegill occur in all three drainage basins in Wisconsin (Lake Michigan, Mississippi River, and Lake Superior). 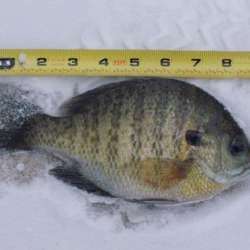 Originally it was not present in the Lake Superior basin, but as a result of widespread stocking, it is now present and reproducing in many lakes and rivers. Spawning takes place from late May to early August (peaking in June) at water temperatures between 67-80ºF. Males select a sand or gravel bar that can be hollowed out to form a nest. 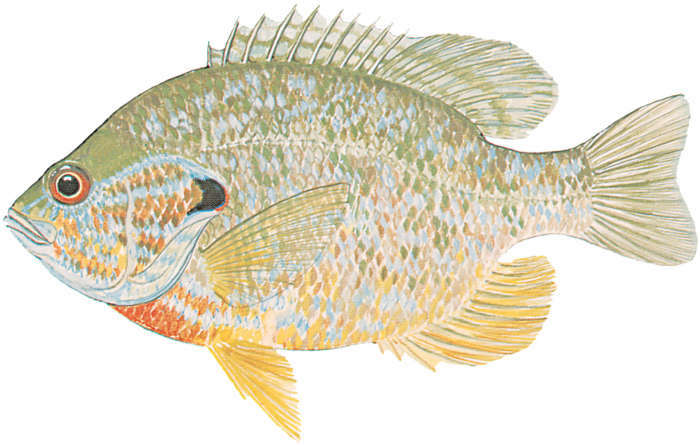 Before and after spawning, the male bluegill defends the nest aainst all species, but most vigorously against other male sunfishes. Plain garden worms are the favorite bait for bluegills, but they can be caught on a number of different types of lures. The fly fisher can have fun with poppers, especially in spring and early summer, when nests are concentrated in shallow water. 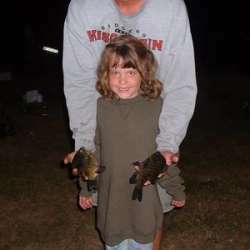 Most large bluegills are taken in deep water during the summer months by drifting with the wind using worms. Wintertime jigging in the weed beds with grubs or mousies on ice jigs also produce excellent results. 3 lbs 8 ozs caught by Darren May caught on Farm Pond on May 10, 1987. 3 lbs 4 ozs caught by Harold L. Catey caught on Pond on January 1, 1972. 3 lbs 2 ozs caught by Phil Algreen caught on Farm Pond on July 1, 1986. 2 lbs 12 ozs caught by Gary Saylor caught on Vaughn Lake, Alcona County on January 1, 1983. 2 lbs 13 ozs caught on Alice, Hubbard County. 2 lbs 9 ozs caught on Green Bay on August 2, 1995.